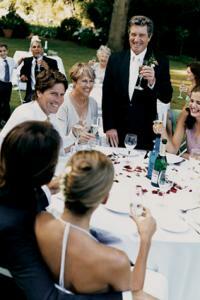 Funny toasts for a wedding go a long way in keeping the reception upbeat and lively. Take the task seriously though, with plenty of forethought and planning. You can tailor any funny wedding toast examples to create an appropriate toast to the bridal couple. Strive to make your wedding toast funny and upbeat, but make sure it's specific to the couple. Before deciding on your toast's style, check out a variety of sample wedding toasts to find the best one for you. The couple will enjoy revisiting funny memories in your toast to them. Remember a time when something funny happened with you and the couple (or you and the groom, or you and the bride), and turn it into a metaphor for a happy marriage. I want to take you all back to several years ago when we took a wild road trip to Colorado. It took two days longer than we anticipated and we had not one, but two flat tires. When we finally got to Colorado we all realized that skiing wasn't nearly as easy as we thought it would be. Who knew that flying down a mountain with two sticks stuck to your feet could be hard? But the important thing here is that we all had a great time, even when things got bumpy. Even when Jerry broke his foot. Even when the lodge ran out of hot chocolate. It didn't matter. Please raise your glasses to a couple who will endure the flat tires, the difficult tasks, the broken bones, and even hot chocolate shortages, all in the spirit of love. Weddings are all about the love between two people. Capitalize upon the love and affection between the bride and groom within your toast while keeping the mood light and funny. Love makes people do strange things. In this instance, love made two people get all dressed up, walk slowly down an aisle and repeat whatever the pastor said. I can't think of any other time these two would do something like this, but I also can't think of a better couple to make this all look downright cool. Join me in raising a glass to the two people who make love look good. If you're able to deliver a deadpan performance, using an analogy about the drink you're raising compared to the happy couple can make for an unexpectedly clever toast. I really like this champagne. To tell you the truth, I wouldn't mind spending a great deal of time with this champagne. I like the look of it, the taste of it, and I like the way the bubbles feel in my mouth. Now this is usually where James would chime in and say something like, "If you love that champagne so much, why don't you marry it?" And I would normally have a clever response like, "Well, if you love Amy so much why don't you marry her?" But... (gestures to couple, already married). I raise my glass to James and Amy, who always seem to be one step ahead of my suggestions. If you're not giving the main toast, or if you just want to keep your sentiments short and sweet, consider one of these quick, funny toasts. Men may be from Mars and women may be from Venus, but you two are so in love it astounds the entire universe. Marriage is a sacred bond between two people, and let me be clear...I said "sacred," not "scared." I don't get all dressed up for just anyone, but when two people who are so in love tell me to put on my fancy clothes, this is what happens. Congratulations to you three: Steve, Mary, and the big mound of debt you've incurred with this wedding reception. I have one piece of advice for you two lovebirds: never stop laughing, even when the jokes are lame. I never thought our bromance could be upstaged, but I humbly bow to the lovely bride who captured his heart. Shakespeare said, "My heart is ever at your service." I say, "Eat candy hearts and order room service." You two remind me of the classic couples. Romeo and Juliet. Homer and Marge. Gomez and Morticia. They say love is blind, but I don't know if I believe that. Everyone within a twenty mile radius of you two can clearly see ridiculous amounts of love between the two of you. Be funny, but don't clown around. It's fine to allow your humorous side to show; it's likely the bride and groom asked you to take on this important role because they knew would would bring some levity to your toast. But don't allow it to turn into a stand-up routine or a silly moment. Run your ideas past a friend beforehand. Sometimes things sound really humourous in your head, but then when they're said aloud they fall flat or border on offensive. Remember your audience. A long list of private jokes between you and the groom will leave the bride feeling excluded, not to mention all the other people in attendance who will feel left out. Stay away from anything that might be insulting to the couple. Something you might think is funny - yet is somewhat insulting to either the bride or groom (or anyone else) - may be perceived as being in poor taste. This is certainly not the time to bring up ex-boyfriends or ex-girlfriends, and is especially is not the time to bring up prior marriages. You should also allow for ample practice by getting your toast written as early as possible. Nervousness is likely going to be a factor no matter how comfortable you are being in front of people. Practice will help ease your nerves and help you deliver the toast. 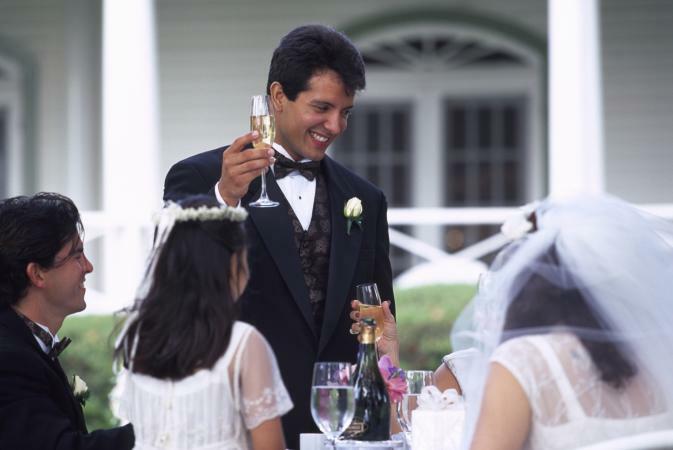 The wedding toast isn't about you or how funny you can be; rather, it's for the wedded couple. Whether you're the maid of honor, the best man, or someone else tasked to deliver a toast, write and deliver a toast that they will appreciate and that will make them laugh without making it turn into a schtick monologue.